What is our shop like? Our shop is in the Plaza del Lago, one of the oldest (& most charming) shopping centers in the US. We love our Plaza del Lago shop! 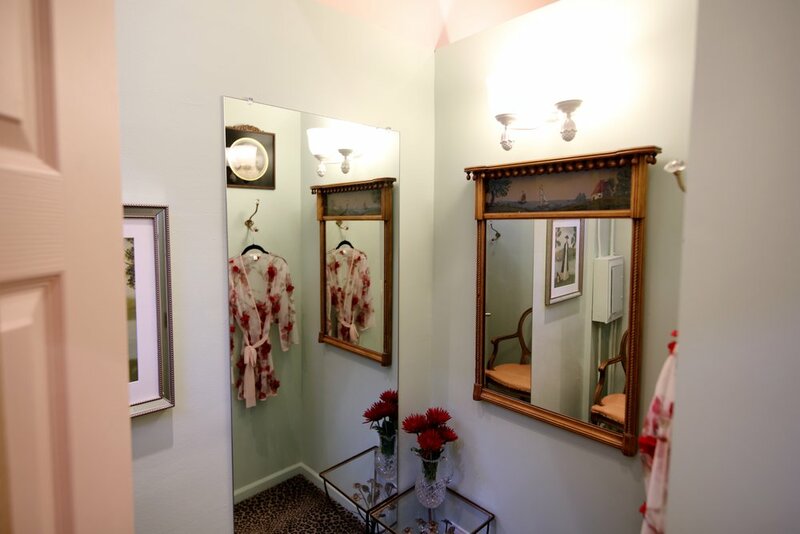 Each fitting room is unique, with its own personality. Larisa & Erika receiving their award in New York, powered by GREAT lingerie and their enduring sense of humor. Swim is here! Our suits are mostly by bra size to help you get your best look. Our #1 strapless bra. It’s the BEST. Many of our bras can’t be found in department stores. This is our #1 bra. A lightly lined t-shirt bra imported from Belgium. Convertible straps. This is our top-selling wire-free bra. All the way from A to DDD. One of our more adventurous customer’s fabulous bra collection - all from Chantilly Lace! We have gift certificates. What amount should you do? We can help you with that. We tend to shy away from utilitarian styles and opt for items that are functional, charming problem-solvers. This is shapewear! We have the best selection of European, top notch bras in Illinois. No one’s going home without some bras! The owner, Larisa, hustling her wares (barrettes actually,) in a Dayton Street (Lincoln Park) garage sale in the DePaul area, 1981. All the women in this picture have become entrepreneurs.